Carrying a bicycle on motorbike? TallPaul_S This post is not being displayed . Posted: 13:54 - 11 Sep 2017 Post subject: Carrying a bicycle on motorbike? Does anyone use their motorbike to carry their (non motorised) bike? I used to do some mountain biking about 10-15 years ago and quite fancy getting back into it, I have access to a car for a few hours at a time but other than that just have my 2 (motor)bikes. Can anyone suggest/recommend a bicycle carrier/rack for a motorbike? The only ready made one I can find is the 2x2 carrier made in the US, can't believe no-one else makes one!? doggone This post is not being displayed . It would fit in a trailer if you took wheels off. You can legally tow a small trailer, but would you want to. Seem to remember seeing an attachment to carry a surf board on one side, which is possibly even more awkward. RhynoCZ This post is not being displayed . Google: ''bicycle on a motorcycle'', get inspired. 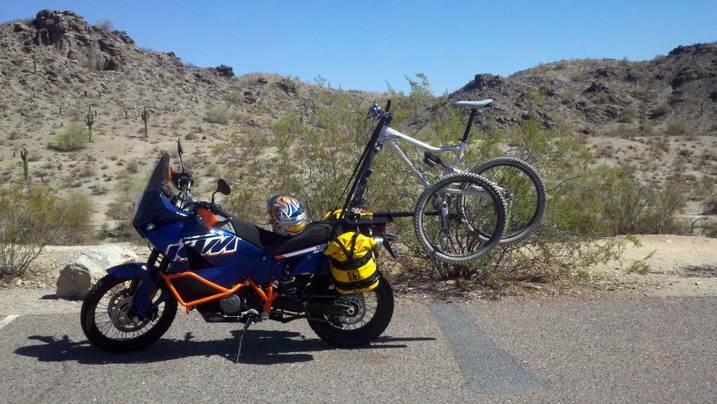 There are all sorts of ways how to carry a bicycle on a motorcycle. Tracer1234 This post is not being displayed . Riding: Yamaha MT-09 Tracer Occasionally Riding: 08 Suzuki SV650, Potato: 2011 Yamaha YBR Custom. Ted This post is not being displayed . I'm watching this thread purely out of interest, and for laughs. But unless it's a folding one, I'd say trailer. Projects: '81 Honda CX500 x2 / '85 Land Rover One-Ten / ...plus many horticultural things. Probably wouldn't be too hard to make one up myself from a bike roof rack and top box mounting. The last post was made 1 year, 223 days ago. Instead of replying here, would creating a new thread be more useful?